This week, we pick up again with the story of Steve Pisanos, a Greek national who trained at Lancaster’s War Eagle Field before heading over to England to fly for the Allies during World War II. Knowing that all work and no play could lead to a serious case of the “blahs” for our boys at War Eagle’s Polaris Flight Academy, officials of Lancaster High School and Junior College opened up their gymnasium for the Eagle Squadron refresher students, giving them the chance to blow off some steam playing basketball. The fellows would hit the gym every Monday night, and really had some hot battles with the local talent in Lancaster. The first night at the gym, Pisanos “the Greek” had his first crack at the game. It was mutually agreed by all present that he had best stick to flying! Squadron 16, which was tuning up for war at War Eagle Field, had many accomplished pilots who had already flown combat in England while members of the Royal Canadian Air Force. Knowing that before long America would be fighting in those skies over Europe, many Eagle Squadron pilots would soon find themselves choosing between two countries looking for their skills. Steve Pisanos was one of those pilots, and answered the call when the United States asked for his services in the cockpit. 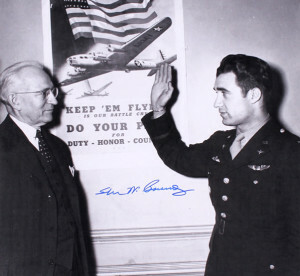 On Sept. 29, 1942, pilot and newly-minted 2nd Lt. Pisanos stood on a field in Debden, England, to say good-by to his Eagle Squadron days, as three Eagle Squadrons were being transferred to the United States Army Air Corps. 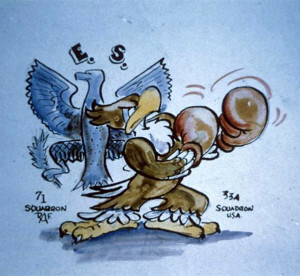 He remembered the speeches that day, but none stood out more than the words of Gen. Carl Spaatz, commanding general of the U.S. Army Air Forces in the European Theater, when he said, “The operational experience of the Eagle Squadrons is a most valuable asset to the fighter units of the American air force. I welcome you with great sincerity.” But Steve had one small problem: he was not an American citizen and his flying status could be in jeopardy. Dr. Henry Hazard, special emissary from the U.S. Dept. of Justice, administers the oath of allegiance as Steve Pisanos became a naturalized U.S. citizen. On May 3, 1943, after a day of flying in his newly-acquired P-47 Thunderbolt, Lieutenant Pisanos was a bit worried when he was greeted by his commanding officers, who picked him up and drove him to their headquarters building. Fearing that the Greek government in exile had gone to the U.S. Embassy to ask for his release from the U.S. Army Air Corps, he entered a room with nervous expectations. 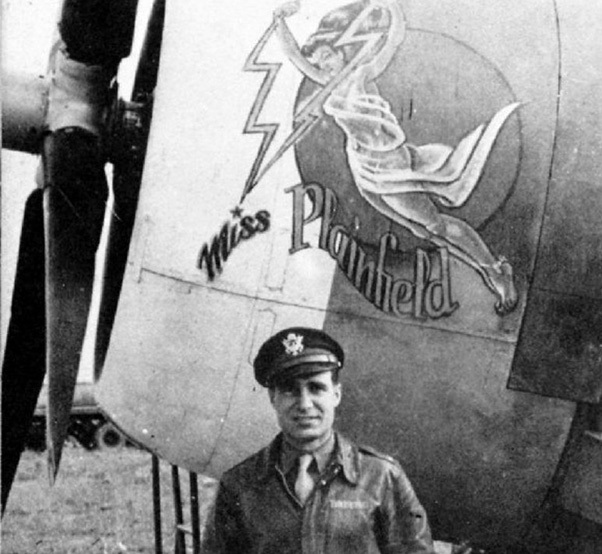 Second Lt. Steve Pisanos, newly minted U.S citizen and American fighter pilot, with his P-47 Thunderbolt. As the crowd from the small gathering started to thin out, three men lingered behind and congratulated the young flier and new U.S. citizen. One was Walter Cronkite, the other Edward R. Murrow — but the one chance meeting that would reach all the way back to his youth and dreams of flying as a young boy in Greece was Ben Lyon. An American actor now living in London, Lyon was the star of Howard Hughes’ World War I epic film, Hell’s Angels. 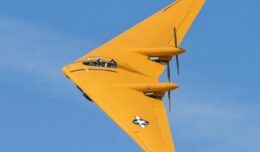 I finish off this story of our War Eagle Field student who flew our skies and went on to become an accomplished Ace, with a bit about his meeting with a young writer for Stars and Stripes that we previously mentioned — Walter Cronkite. Cronkite had written an article about Steve for Stars and Stripes. Departing town after the interview and leaving aboard a crowded train, a shiny new P-47 Thunderbolt buzzed his train and sent people ducking for cover. The plane came back for a second pass and wagged its wings, and Walter realized it was his new Greek pilot friend wishing him good-bye. Funny, I wonder if he learned those buzzing techniques chasing jackrabbits and dodging Joshua trees here in the Antelope Valley. Until next time, Bob out …!